Below are listed the most amazing natural and man made landmarks of Turkmenistan. Door To Hell (Darvaze burning gas field) – Daşoguz. Man made collapse doline, a collapsed cavern with a diameter of some 70 m and depth of some 20 m. It formed during the exploration of petrochemical resources in 1971 and has been burning since then with bright flames. Gokpatlavuk mud volcano – Balkan. Approximately 70 m tall mud volcano with muddy, green lake in its crater. Korpedje Fire Lake – Balkan. Stormy lake with a fire fountain in the middle. This is abandoned oil well, which, most likely started to burn in 2002. Western Porsygel and Pink Porsygel – Balkan. Active mud volcanoes, Pink Porsygel has muddy pink color but Western Porsygel has thermal water. Hashim-Oyyk cave (Hoshmoyuk Cave) – Lebap. Approximately 10 km long cave which is adorned with beautiful aragonite and gypsum crystals. Kap Kutan cave – Lebap. Gorgeous cave systems with enormous crystals of aragonite and gypsum. Some calcite crystals are almost 2 m long but aragonite crystals form something similar to snow-white forest where one can get lost. Total length of cave system exceeds 80 km, longest cave is Kap Kutan II – 57 km, cave is up to 1,017 m deep. Kov-Ata Cave (Baherden Cave) – Ahal. Cave with large thermal lakes, popular tourist destination. Length – 250 m, depth – 69 m. Lake is 75 m long, up to 26 m deep. Temperature in the lake is 37° C.
Eroylanduz depression – Ahal. 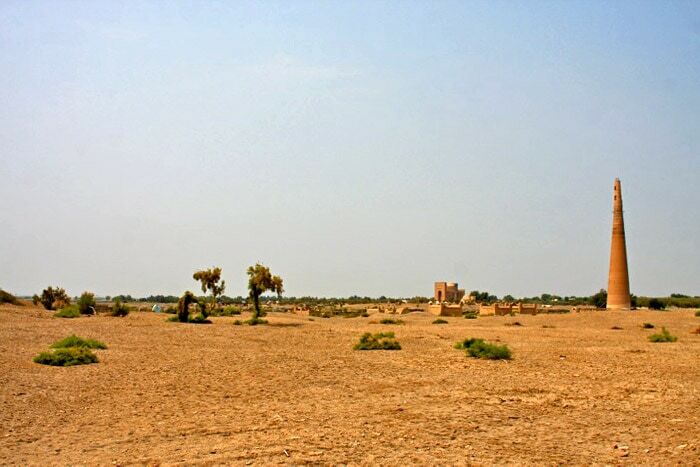 Arid area with rich finds of fossils of Eocene fauna including remnants of beetles, eggs of ostriches and others. Plateau of the Dinosaurs (near village of Khodga-Pil) – Lebap. One of the best collections of fossilized dinosaur tracks in the world. In total more than 3,000 dinosaur tracks have been found, largest are 70 cm long. Longest trackways reach 200 m.
Mandragora turcomanica find near Garygala – Balkan. The only find of extremely rare Mandragora turcomanica. Only some hundreds of this plant remain in wild. Most likely it has very potent medical properties but this knowledge, even if ancient people knew it, is lost now. Sumbar floodplain forests – Balkan and Ahal. In the middle reaches of Sumbar river are located floodplain forest with some of world’s richest genetic pools for subtropical fruit and nut bearing trees. Hur-Hury Falls (Nokhur Falls) – Ahal. 30 m tall waterfall. Yangikala canyons – Balkan. Dry, colorful badlands with impressive canyons. Cliffs are more than 60 m tall. Altyndepe – Ahal. Site of very old city which was built and inhabited in Bronze Age, in the 3rd – 2nd millenia BC. This place had contacts with the Late Harappan culture. In the city are located remnants of early ziggurat. Found models of two-wheeled carts from around 3000 BC – oldest depictions of wheeled transport in Central Asia. Gonur-Tepe – Mary. Ruins of very old city from 2500 BC. Site contains remnants of a fortification wall and temples with fire altars. Citadel was 100 by 180 m large. In this region have been found numerous other settlements from this time. Namazga-Tepe – Ahal. Remnants of Bronze Age city, which started to develop sometimes around 2500 BC and turned into a true city sometimes around 2000 BC, when it, possibly, was a regional centers. Declined around 1600 BC. Ulug Depe – Ahal. 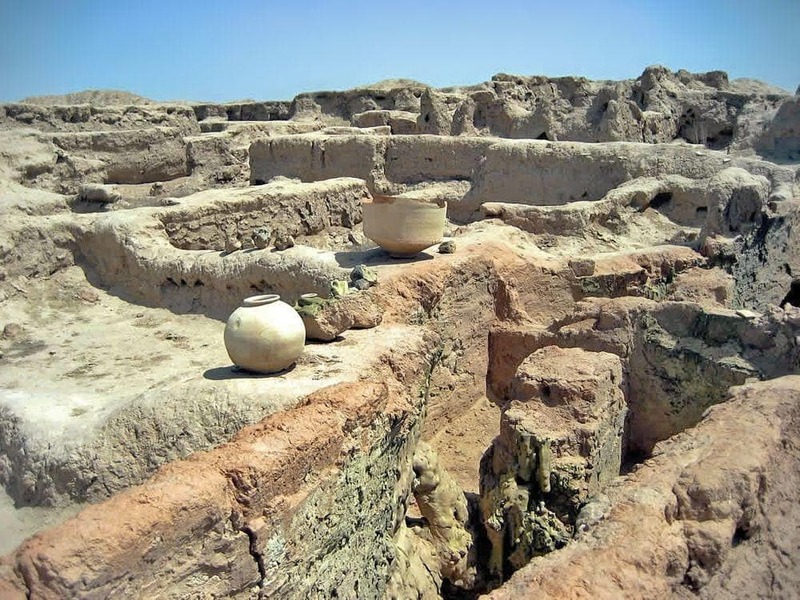 Remnants of early town which flourished in the late Neolithic – early Bronze Age (the 6th millenium BC) and existed until the 1st millenium BC. 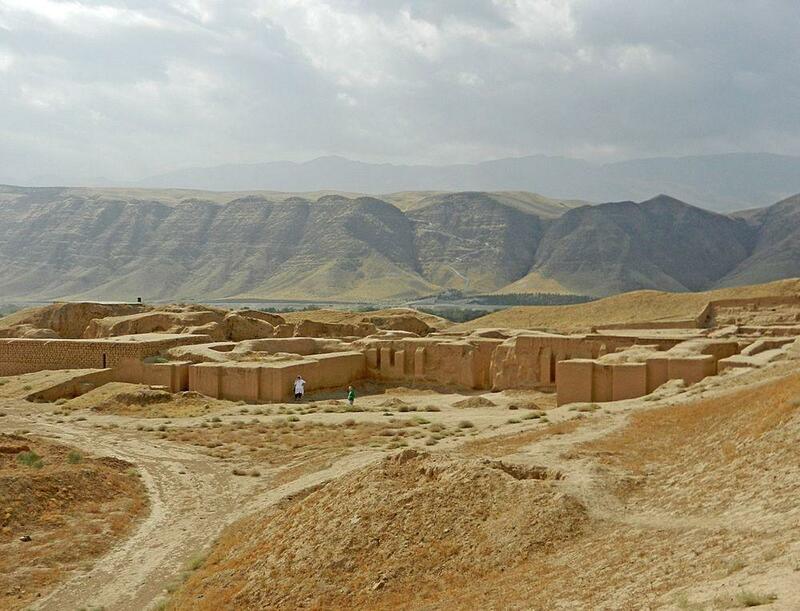 A massive citadel from bricks was built here in pre-Achaemenid times (before the 6th century BC). Now the hill, which covers the city, is some 30 m tall. Chilburj – Mary. Ruins of Parthian fortress and Sassanid town. Fortress is 260 by 200 m large. Walls of this massive fortress have been partly preserved. Fortress was founded in the 2nd – 3rd century AD and in the 5th – 7th century AD it was lively caravan city which existed until the Mongol invasion. Gebekly – Mary. Impressive ruins of ancient Parthian city which was built in the 1st century BC and existed until Sassanid times in the 4th century AD. Ruins rise 12 – 13 m tall. Site contains a Parthian palace – the House of the Ruler. Nisa – Ashgabat. Ruins of the ancient capital of Parthians, with two important Parthian fortresses. Here have been found multiple artifacts of Hellenistic culture. Flourished in the 3rd century BC – 3rd century AD. Capital city was destroyed by earthquake in the first decade BC but later it was renewed. Ak-Kala fortress – Daşoguz and Uzbekistan, Karakalpakstan. City – fortress, which was built after the Mongol attack on Central Asia in the late 14th century. City walls are still standing and are up to 6 m tall. Izmukshir – Daşoguz. Ruins of ancient and medieval city. Fortress was built here in the 3rd century BC but the city flourished in medieval times, when magnificent fortification walls were built. Also now the remnants of massive fortification walls (1,500 m long) are the most impressive remnants. Merv – Mary. 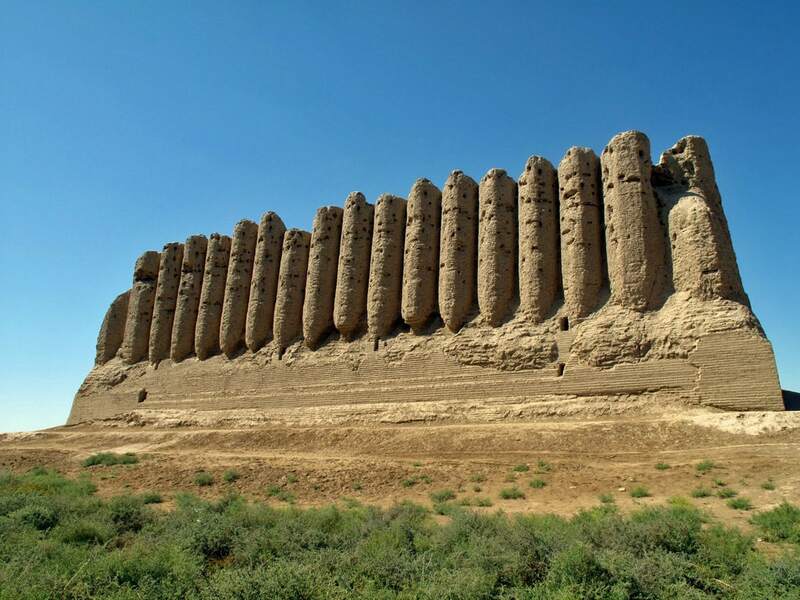 Once magnificent oasis city on Silk Road, the best preserved one in Central Asia. Settlement established in the 3rd millenium BC, but flourished in the 8th century – 1221, when it briefly was one of the largest cities worldwide. Today are seen remnants of several walled citadels close to each other – Erk Kala, Gyaur Kala and the medieval Sultan Kala. Mishrian (Dehistan) – Balkan. Ruins of medieval caravan city. Founded in the 3rd century BC, flourished in the 10th – 14th century. City has massive fortifications – it was enclosed in double wall. Near the city is Meshat cemetery with fine mausoleums. Especially impressive is Shir Kabir mausoleum from the 10th century AD. Urgench – Daşoguz. Ruins of the former capital of Khorezm, part of Achaemenid Empire. City developed on the Silk Road several centuries before our era. Flourished in the 10th – 14th centuries. Here are found ruins of several impressive medieval buildings, city developed influential regional school in architecture and construction engineering. Butentau Caves (Butendag caves) – Daşoguz. Group of rock cut caves, inhabited in the 4th – 17th century AD. Caves are cut in the precipice of Butendag Plateau. Today these caves are inaccessible without special equipment. Caves and surrounding walls contain petroglyphs, also something similar to runic inscriptions. Yekedeshik Caves – Mary. System of man-made underground passages, made in the 14th or 15th century (?). Almost nothing is known about their history and purpose of building. Caves have been created in five levels and have numerous cave rooms (more than 100). One room has vaulted ceiling with ribs and something similar to altar at one end. Alem Cultural and Entertainment Center – Ashgabat. Impressive building of civic center, built in 2012. Structure is 95 m tall and has very unusual architecture. The structure contains world’s largest Ferris wheel with a diameter of 47.6 m.
Kharoba Koshuk – Mary. Remnants of Nestorian church near the ancient city of Merv. This enormous, 41 m long structure was built before the 5th century AD. Kutlug-Timur Minaret – Daşoguz. 60 m tall minaret which was built in the 11th or 12th century AD. Kyz Qala – Mary. Two royal palaces in Merv, built in the 8th century AD. Castles are built from mud but look very impressive even after 1,200 years. Especially impressive is Grant Kyz Qala. Turabek-Khanum Mausoleum – Daşoguz. Sophisticated structure – mausoleum for the wife of ruler Kutlig-Timur. Most likely built in the 14th century. Building has beautiful tile mosaics. Turkmenistan Tower – Ashgabat. 211 m tall communications and observation tower, built in 2011. Tower has very unusual and somewhat kitschy architecture with giant star-shaped part at its base. Ruins of ancient cities and fortresses. Hundreds of hills and crumbling ruins all over the country testify – this country had a great and interesting path. These were not just common cities: Merv was one of world’s largest cities (largest?) in the beginning of the 13th century but Urgench was major center of culture, influencing architecture and art in the whole Central Asia. Geological heritage linked to oil and gas finds. Turkmenistan has extremely rich finds of oil and gas – and this (as well as human interference) has created interesting and even unique landmarks, such as Door To Hell and Korpedje Fire Lake. Nothing is forever – even Merv today is in ruins. This city existed for some 2000 years and for a while it was the largest in the world. Remember this, New York, Hong Kong or London! Turkmenistan is one of the few countries of any size left on the globe which is not the subject of a dedicated travel guide in English (major competitors cover Central Asia as a region). Yet, lying as it does at the heart of the Silk Road route, it is a historically and culturally rich land. Travelers can gain insight into the heritage with the clear itineraries supplied of the major archaeological sites of Merv and Konye Urgench and coverage of Turkmen pilgrimage shrines. For travelers looking to explore further afield, this guide spans the whole country comprehensively, including little-known sites such as the Yangakala canyon and the flaming crater at Darvaza. Turkmenistan is a remarkable country with beautiful and rarely visited ancient ruins from the Silk Road. Highlights include the ancient city of Merv, once the largest city on earth, the striking ruins of Gurganj, the marble and gold of modern Ashgabat, and the unique experience of the ever-burning desert gas field, the ‘Gate of Hell’. The rulers behave eccentrically; building gold statues of themselves, renaming bread after a Presidents’ mother, banning beards, gold teeth, facebook and lip-synching. Far Flung Places Guides provide an insight into the key places to visit, with historical context, travel tips and humor.